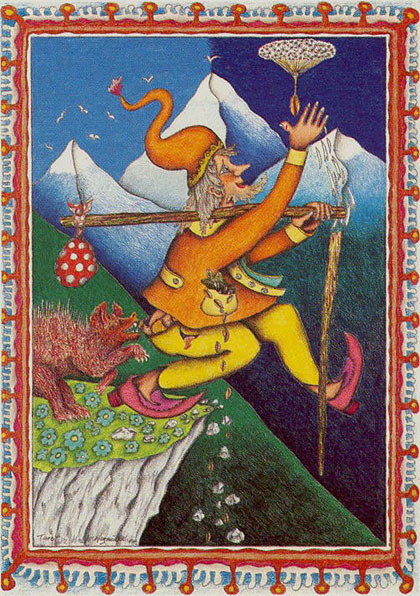 Known as the Neuzeit Tarot , which translates to English as New Age , it is a creation of painter and musician Walter Wegm�ller known as the Swiss Gypsy who was on the run from authorities in the late '60s when he hung out with artist H.R. Giger, and in the early '70s, with LSD guru Timothy Leary. This is one very trippy deck! Is that a psychedelic mushroom on The Fool card? The characters on the cards have peculiar faces and some of the cards are just strange beyond description. Each card has a unique patterned border. You may be interested to know that Wegm�ller composed an album called Tarot in 1972 with a band called the Cosmic Couriers which when released the following year included this tarot deck in it's packaging. He would later go on to form a new group called the Cosmic Jokers, but that's an entirely different story.